Gus Casely-Hayford grew up hearing stories about gold—the lustrous metal was part of family lore and legacy. Like a number of middle-class Sierra Leoneans, his maternal grandfather found success trading gold and traveled for days, sometimes weeks for work. After a trip, his grandfather would come home, hug his family and pull something out of his pocket for his daughter. “He would bring from his pocket a little satchel full of gold nuggets and gold dust in tiny bags. And he would give my mother a small nugget that she could have made into a piece of jewelry as a remembrance of that particular journey,” he says. For Casely-Hayford, gold is nothing short of a time capsule. The material is deeply entwined with his Creole grandfather’s story, who immigrated to Sierra Leone from Barbados. Today, the British-born Casely-Hayford is the director of the Smithsonian’s National Museum of African Art and holds a doctorate in African history. He is leading a museum tasked with connecting Washington, D.C. and the world with Africa through the continent’s visual culture. Among the museum’s most talked about exhibitions is “Good as Gold: Fashioning Senegalese Women,” which features glittering treasures, gleaming coins and eye-catching jewelry and tells a rich story about the universally precious metal and its special relationship with the people of West Africa. Gold also provides an enduring link to the past, says Casely-Hayford in a new Sidedoor podcast that takes listeners on a journey through parts of the region. The exhibition not only celebrates the allure of gold in contemporary West African fashion, but its power as an economic engine in the region during the medieval period. “One of the stories I love is the story of Mansa Musa,” Casely-Hayford says. 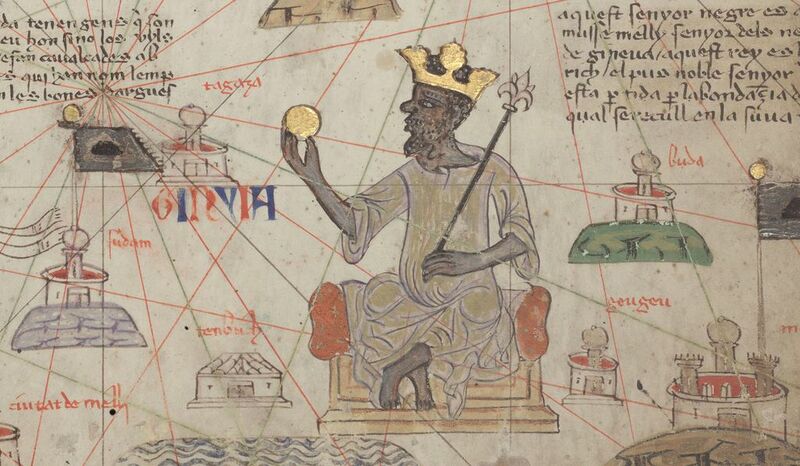 Mansa Musa the 14th-century ruler of the Mali Empire, who historians say is the wealthiest man who has ever lived . His dominion spanned present-day Senegal, Gambia, Guinea, Guinea-Bissau, the Ivory Coast, and parts of Ghana, Mali, Burkina Faso, and Niger . Mansa Musa ruled a region known globally for its vast amounts of alluvial gold which would be exported around the Medieval world through trans-Saharan trade networks. Widely historicized as a benevolent emperor, Mansa Musa built his legacy on gold and used it to fund one of his greatest achievements—Timbuktu. Under his rule, the city was transformed into a global intellectual hub when Europe’s Enlightenment Period was still centuries years away. As a devout Muslim, he made the pilgrimage to Mecca for Hajj, which served as both a spiritual and diplomatic journey. Traveling with an entourage that an Arab historian said included 20,000 people and 80 camels, each carrying 300 pounds of gold, Mansa Musa transformed the perception of his empire. At a stop in Cairo, the emperor attempted to demonstrate his wealth and generosity to the public. The “Good as Gold” exhibition connects people to key parts of West Africa’s history—including when it was home to an empire that was a focal point for learning and commerce. As the director of the African Art Museum, Casely-Hayford is tasked with connecting visitors in Washington, D.C. with the visual culture of a continent that has long been relegated to the periphery of American textbooks, news coverage and public understanding. “I think for peoples of African descent, our history has been assaulted in so many ways, by enslavement, by colonialism, by racism, by so many different things that have really served to undermine our sense of self and our sense of history,” he says. For him, focusing on gold in one of the country’s most influential African art museums highlights history, contemporary culture and the intimate experiences of individuals and families. “Good as Gold: Fashioning Senegalese Women,” curated by Amanda Maples and Kevin D. Dumouchelle, is on view at the Smithsonian’s National Museum of African Art in Washington, D.C. through September 29, 2019.